DNA has provided evidence that modern humans interbred with Neanderthals 40,000 years earlier than previously thought. 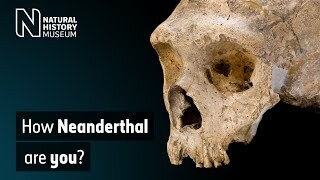 Museum human origins expert Professor Chris Stringer explains why the discovery has raised surprising questions about the history of our species. Modern human DNA has been found in the genes of a Neanderthal woman from the Altai Mountains in Siberia. The research, published in the journal Nature, is the first evidence of DNA from Homo sapiens entering a Neanderthal population instead of the other way around. Until now, scientists thought the earliest interbreeding between the two happened after 60,000 years ago. But the new findings suggest the woman's Neanderthal ancestors bred with earlier modern humans much earlier - about 100,000 years ago. Prof Stringer says: 'So far there has been no evidence suggesting modern humans and Neanderthals met and interbred before 60,000 years ago. 'Some human fossils have been found in Israel from about 100,000 years ago, but it is generally agreed that this was a failed dispersal from Africa, and it went no further. Comparison of Neanderthal and modern human DNA suggests they diverged from a common ancestor at least 430,000 years ago. 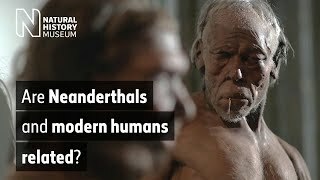 Neanderthals, one of our closest extinct relatives, continued to evolve in Europe and Asia, while our ancestors evolved in Africa. It is generally agreed that it wasn't until about 60,000 years ago that modern humans migrated across Eurasia, breeding with their Neanderthal cousins as they did so. The older human fossils from the Israeli sites of Skhul and Qafzeh, dated to around 100,000 years ago, are usually regarded as representing a failed dispersal of a small group of modern humans from Africa, which did not establish itself further afield. But the new findings provide a surprising source of evidence for the presence of modern humans in Asia before 60,000 years ago. Together with the recent dating of 47 modern human teeth in southern China to at least 80,000 years ago, the finding suggests that modern humans did successfully migrate beyond Israel into Asia before the 60,000-year-old dispersal. Geneticists at the Max Planck Institute for Evolutionary Anthropology and their colleagues compared the genes of a Neanderthal from the Altai Mountains in Siberia with those of two Neanderthals from Spain and Croatia. They found that a population of modern humans contributed genetically to the ancestors of the Siberian Neanderthal roughly 100,000 years ago. But no modern human DNA has yet been identified in the European Neanderthals. 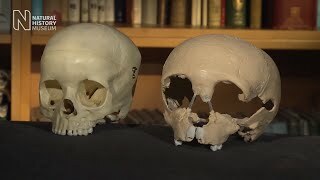 A model of an early modern human (left) and a Neanderthal (right). The findings suggest that as well as later interbreeding, the ancestors of Neanderthals from the Altai Mountains and early modern humans met and interbred, somewhere in southern Asia, many thousands of years earlier than previously thought. Anywhere in southern Asia could have been the location of this early interbreeding, since scientists don’t know how widespread Neanderthals and early modern humans might have been in the regions between Arabia and China at this time. Prof Stringer says: 'At the moment we simply don't know how these matings happened and the possibilities range from relatively peaceful exchanges of partners, to one group raiding another and stealing females, through to adopting abandoned or orphaned babies. 'Eventually, geneticists should be able to show if the transfer of DNA in either direction was mainly via males, females, or about equal, but it will need a lot more data before that becomes possible.